Work continues this week on the Orange Line busway extension from the Chatsworth Metrolink station to the Canoga station. 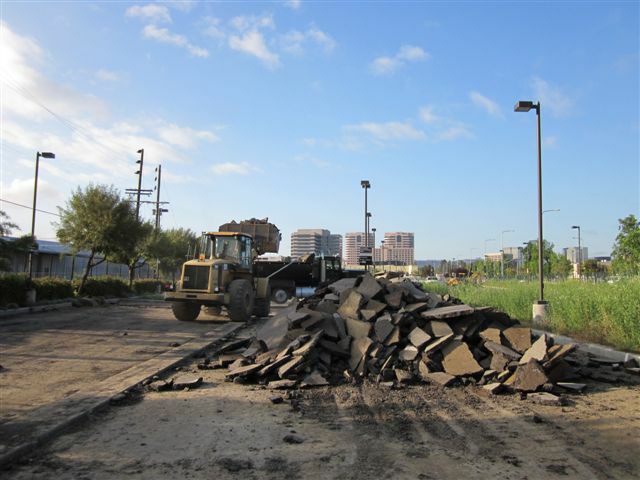 The above photo shows asphalt that was torn up in the Canoga station parking lot to make room for the busway and station platforms. Here’s the latest construction update. The parking lot remains open, but only the Vanowen entrance is in use. Metro is targeting summer 2012 as the completion date for the project, which is being funded by Measure R.
What a shame…should have been a light rail line. Yes, it would have been a great light rail line, but a dedicated busway is better than nothing at least. Hopefully if Measure R 2.0 ever comes into existence The Orange Line conversion should be one of the its top priorities. I don’t think anyone doubts that. But then again, Valley residents getting their fair share would be radical departure from long-established policy. Or a subway would have been nice for the whole Orange Line. It’s a BRT because there was a monumental amount of kvetching from SFV residents and businesses about the construction and cost that would have been needed for either a Light Rail or heavy rail line. The biggest issues with the orange line are that, because its not a rail line, its overcrowded and can be a rough ride on some sections, does not have level boarding, and also the lack of crossing gates at intersections and no signal preemption makes what could be a 30 minute ride to cross the valley more of a 45 minute ride. A very big difference. A red line extension could have actually worked well because, contrary to popular belief, it is in fact possible to run third rail HRT at-grade similar to the way the CTA trains in Chicago run in their at-grade sections. Maybe this can be done in the future and also connect to a 134 project east of NoHo that would go to Pasadena because its time us valley residents get our share of quality mass transit. Also, any news on the van nuys/sepulveda pass corridor? I Don’t mind taking the Orange Line for a few miles. but man is it Slow…….. This Line and the Gold Line and Blue Line all need Crossing gates, stopping traffic and having REAL priority at intersections. The Orange Line has as much ridership per mile as the Gold line and it costs about 1/3 as much to build. If it was built as a rail line, then the several hundred million dollars spent in it’s construction could not have been used for other things such as buses. There is much more bang for the buck with a bus rapid transit line compared to light rail. It also takes much less time to build a BRT compared to light rail. Look how long it’s taking to complete the first leg of the Expo line and the Orange Line extension will probably be completed from start to finish in less than two years. Just a handful of months after the Expo line opens up. Look the Valley is growing a BRT does no justice to riders of SFV. It’s shamefull that Metro has passengers comming off a 175ft car times 6 into a 60 foot bus and one 65ft bus. A rail line is the best option for this corridor. And the funny thing about this is the same residents that opposed a rail line in the first place are now asking to see if a rail line could be studied for the Orange line! Metro if your reading this seriously start thinking about coversion we all know eventually the Orange line will become rail. A BRT is what the Silver line and Silver Streak is, not the Orange line. The Orange Line may have been cheaper to build than the Gold Line to Pasadena but you get what you pay for. This thing is at capacity right now I have ridden it Midday (10 am) and can attest that this transit corridor is packed. The Gold Line has room for growth where as the Orange Line without the help of higher capacity buses will have a difficult time breaking 30,000 riders per day and even with those buses I doubt it could reach Blue Line ridership levels. Capital Cost for BRT are cheaper than Light Rail but Operational Cost are higher. One bus driver can carry about 60 passengers per bus while 1 train operator can theoretically carry close to 800 passengers under crush loading on a 3-car Light Rail Train. Comparing the Expo line to the orange line is comparing apples to oranges. The expo line has several grade separations as well as crossing gates which are all things that unquestionably make the line better. The orange line has none of those so that’s why it was cheaper but you get what you pay for. Plus the Orange line lacks many safty features. I thought safty was first but I guess not on the Orange line. On top of that Metro wants to save money yet they are spending millions more on operating cost???? Light rail is cheaper to operate. Thats what happens when you put zero operating experiance into management. Gosh how I miss RTD. I think you are being a bit unfair with Metro on this one. In 1991 the Robbins Bill prevented the use of rail unless it was deep on tunnel on the right of way in the Valley Glen area. Then in 1997 Zev’s subway ban was passed leaving busway or nothing for this corridor. Though I do question the lack of crossing arms but I guess it was unprecedented for a busway before. 2) Build the Westside Subway Extension and Sepulveda Pass Project as quickly as possible to provide alternatives when the line (or parts of the line) is not in-service due to construction.